TEPSA has recently coordinated a workshop and a publication for the European Parliament’s Subcommittee the European Parliament’s Subcommittee on Human Rights (DROI) on Towards an EU common position on the use of armed drones. The workshop took place in Brussels on 22 March 2017. The publication includes a briefing prepared by Jessica Dorsey (Associate Fellow at the International Centre for Counter-Terrorism – The Hague) with specific recommendations on the elements that a future Council decision on the use of armed drones should include, and a workshop report prepared by TEPSA Project Officer Giulia Bonacquisti. 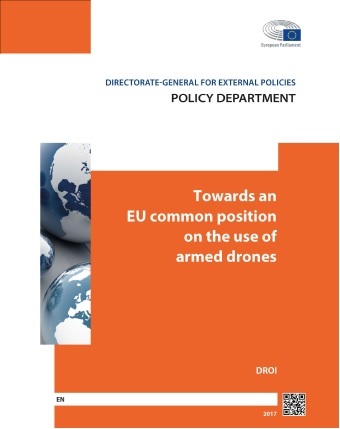 The discussion at the workshop confirmed that there was broad support in Parliament for the development of common European principles governing the use of armed drones, not least in view of the emergence of new risks from non-state actors and the EU’s commitment to enhancing security and defence cooperation. While there is currently no agreement between Member States to pursue the matter at EU level, the workshop debate drew attention to the common rules on exports of armed drones and drone technology that already exist. Furthermore, progress has been made recently in agreeing a joint EU position regarding the related matter of lethal autonomous weapons. The full publication, including both the briefing by Jessica Dorsey and the workshop report by Giulia Bonacquisti, can be downloaded here.